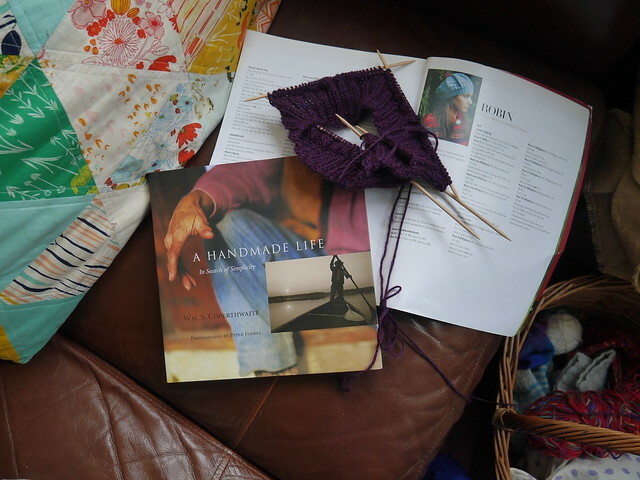 Yarn along hosted by Ginny at Small Things. I’m finally working on a vest for me. I’ve finished that book now, what an amazing women she was! Loved the book! Estou finalmente a fazer um colete para mim. Já acabei de ler o livro, que mulher incrível que ela foi! Adorei o livro! A reader asked me about the jam and ice cream we made the other day. I thought to write up a quick post, as it might be useful for other people too. I use and recommend The Basics Basics Jams, Preserves and Chutneys handbook, it has everything you need to know, how to prepare the jars as well as various recipes. 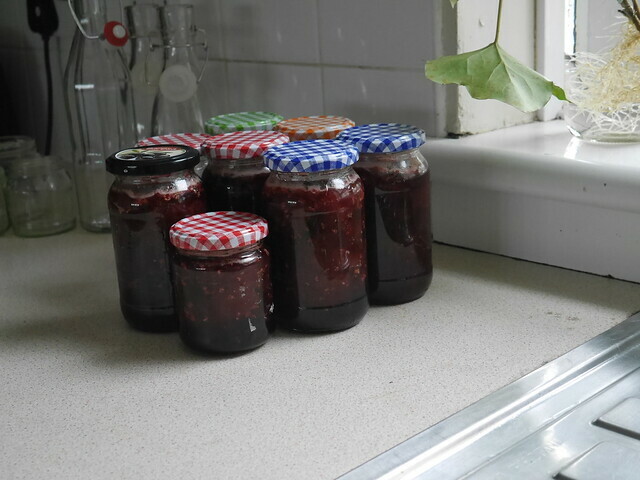 For those who have never made any jam, the process, simplified, goes something like this: cook fruit in low heat, until you like the texture and most of liquid has evaporated, add sugar, once that is dissolved bring to high heat to reach setting point as fast as possible. In the book there is only one strawberry jam recipe, to add other flavours, like lavender or elderflowers (I think rosemary might be good too), I steered the flowers or lavender, after the fruit was cooked but before adding the sugar. I doubled the recipe which filled two 450g jars and one 230g. I use any kind of jar, but most of them are from Lakeland (this ones and this ones) as well as their lids. I also use wax discs from lakeland (I swear I’m not being paid for advertising, it simply is what I use), which sits on the top of the jam to avoid contact with air, I bought them a few years ago and still have years of discs worth. By the way, this is an interesting method that I want to try soon. Now the ice cream. I simply poured a bit of honey over the strawberries, then into the blender, after that mixed with the yogurt, basically you just want to make a very thick smoothie. I then poured into ice lolly molds. Technically might not be an ice cream ( I’m sorry if I mislead you) but it gets as much excitement as any shop-bought! Uma leitora pediu-me dicas sobre o doce e o gelado que fizemos no outro dia, então, resolvi escrever um poste, pode ser que a informação seja útil a outras pessoas. Eu uso e recomendo o livro The Basics Basics Jams, Preserves and Chutneys handbook, tem tudo o que se precisa saber, como preparar os jarros, assim como as receitas. para quem nunca fez doce, o processo simplificado é mais ou menos assim: coze-se a fruta em lume baixo até gostar-mos da textura e a maior parte do liquido ter evaporado, adiciona-se o açucar, quando este estiver dissolvido aumenta-se o lume para muito alto para atingir o ponto o mais rapido possivel. Eu uso qualquer tipo de jarro, mas a maior parte são estes e estes do Lakeland, assim como as tampas. Também uso os discos de cera da mesma loja (eu juro quie não estou a ser paga para fazer publicidade, é simplesmente o que eu uso). esses discos são para evitar que o doce venha em contacto com o ar, comprei-os à uns anos atrás e tenho ainda que dê para muitos mais. Já agora, este é um método interessante que quero experimentar em breve. Agora o gelado. Simplesmente coloquei um pouco de mel e os morangos no liquidificador, depois juntei iogurte, basicamente é como se estivesse a fazer um smoothie muito grosso. Quando estavamos todos contentes com o sabor, colocamos nas formas de gelado. Tecnicamente isto se calhar não é um gelado, mas as crianças têm tanto entusiamo como se fosse do supermercado! First, thank you very much to everyone, for the reception of our news! Lately I’ve only been reading non-fiction books, I’m nearly finish with “In their own way”, which I’m really enjoying it! And yesterday another book arrived: “Letting in the wild edges” by Glennie Kindred. It’s a book that has been recommended by a friend, and I can’t wait to dig in. I’m also very excited about the knitting, which is a test knit for wollenflower‘s pattern, of this beautiful Faroese shawl. Primeiro, muito obrigada a todos, pela recepção das nossas novidades! Ultimamente só tenho lido livros que não são de ficção, estou a quase a acabar “In their own way”, o qual estou a gostar muito. E ontem chegou o livro “Letting in the wild edges” da Glennie Kindred. este foi um livro recomendado por uma amiga, e eu mal posso esperar por começar a ler. Também estou muito contente com o projecto de malha que estou a fazer, que é um teste para wollenflower, para o esquema deste belissimo xaile das ilhas Faroe. We’ve been house bound for… Three? Four days? 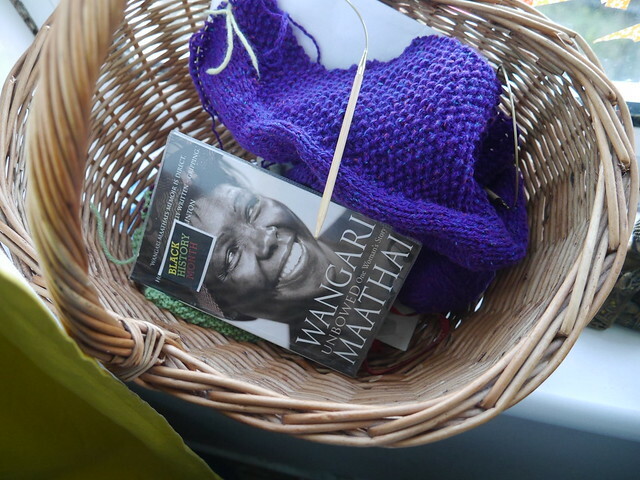 We’re all ill, nothing serious, fortunately, but annoying nonetheless, so today I made the effort to drag us all to the library, for some fresh air and a new stack of books. One that I brought for me was this one, I’ve only read the first page, so not much to report. I’m starting a new pair of socks. I’ve been working on my Indigo vest, but I’ve hit a point where I’m making up the sleeves as I go, and this weekend I’m going on a trip, where I’ll be seating in a car for about two, possibly three hours. One can get a lot of knitting done during that time! 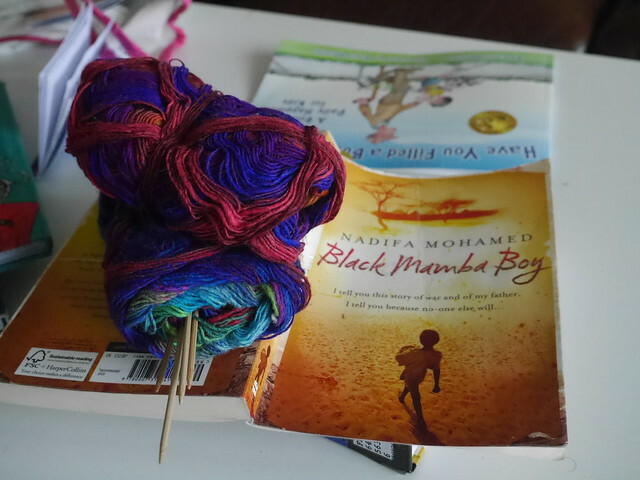 Socks are one of my favorite mindless knitting, and is perfect for a road trip. P.S. : There is a give away, if you would like to enter. 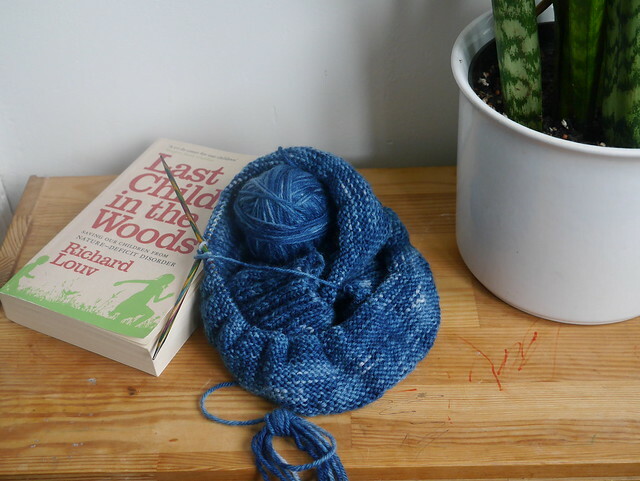 I started knitting a vest, for me, with my indigo dyed yarn, so far so good! I saw the “last child in the woods” book at the charity shop, and even though I don’t need more encouragement to spend time in nature with or without my children, I bought it because I was curious after reading and hearing about it so much. Comecei no outro dia a tricotar um colete , para mim, com a lã que tingi com indigo, e estou a gostar muito do efeito! Encontrei o livro last child in the woods” na loja de caridade, e apesar de eu não precisar de mais encoragamento para passar tempo na natureza com, ou sem as minha crianças, comprei na mesma porque estava curiosa, pois tenho ouvido e lido tanto sobre o livro. Some people don’t ever knit the same thing twice and that like to feel challenged by each knitting they take on, I’m not one of them. 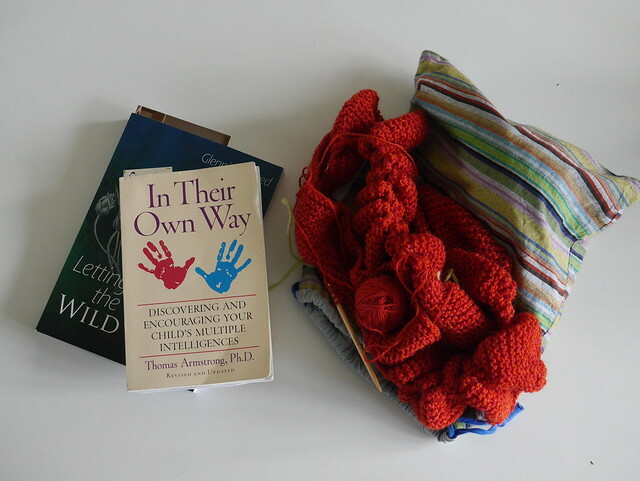 I prefer the kind of knitting that let’s you knit without paying much attention to it, the kind that I can take anywhere without the pattern or my notes, mindless knitting some may say. 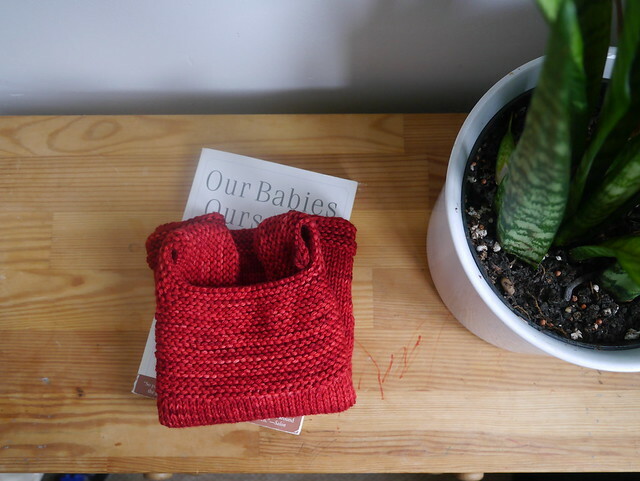 So, when a friend gave the very good news that they had a baby, I couldn’t think of anything else that would be more practical and fast to knit, than another milo vest, this time to be sent to Portugal. To complete the gift, I added one of my favorite books about babies and parenting: “Our babies ourselves”. 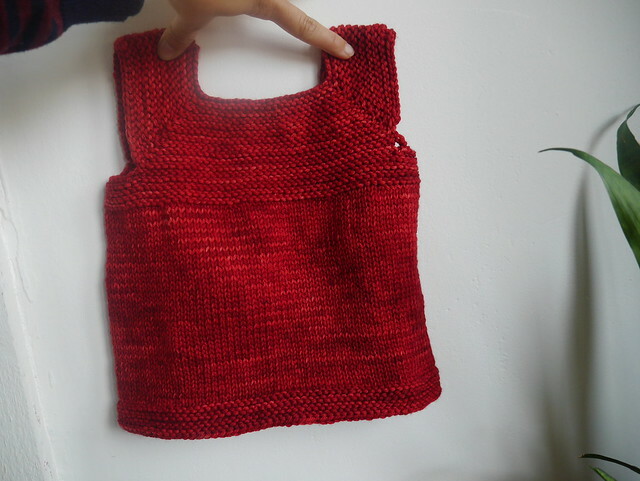 Details of the vest, on ravelry. Há pessoas que não gostam de tricotar a mesma coisa duas vezes, e querem aprender coisas novas com cada projecto que começam; eu não sou assim. O tipo de malha que eu prefiro, é aquela que não requer muita atenção e que posso levar para qualquer lado sem ter que pensar no esquema ou nas minhas notas. Então, quando uma amiga me deu as boas noticias de tiveram um bebé, eu não consegui pensar em nada mais practico e rápido do que um colete. Para completar a prenda juntei um dos meus livros favoritos sobre bebés e puericultura:”Our babies ourselves”.